Home » lucky » lucky draw » Maggi » mms » purchase » qna » spend » travel contest » MAGGI Royale Choose Your Own Adventure Contest : Win Travel Package of Your Choice Worth Up To RM20,000! 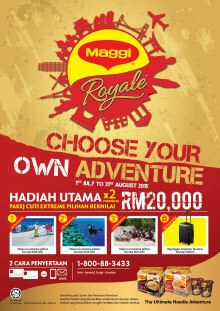 MAGGI Royale Choose Your Own Adventure Contest : Win Travel Package of Your Choice Worth Up To RM20,000! Purchase 1 MAGGI® Royale™ Multipack or 2 MAGGI® Royale™ Cups. Tick the correct answer, complete the contest entry form and attach your original receipt. Please answer the statement below using TRUE or FALSE: The MAGGI® Royale™ Choose Your Own Adventure contest offers 142 prizes to be won. Take a picture of the original receipt and type the following captions: Full Name <space> IC No <space> Answer <space> Date of Purchase. e.g. ADAM AZIZ 920928XXXXXX TRUE 01/07/15 and send your MMS entry to 017-338 6443. Visit MAGGI Royale Choose Your Own Adventure Contest form for more details.